State University of New York Press, 9780791429488, 240pp. 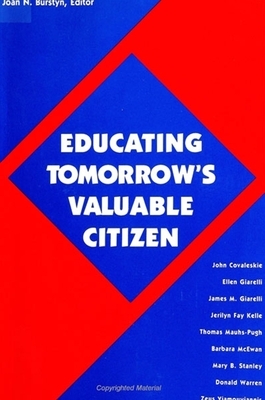 The authors discuss the dilemmas that face those who would educate tomorrow's valuable citizens and describe the day-to-day commitment needed to maintain a community. Important questions are asked: How do our public schools educate children to become members of our particular "public?" What problems face citizens of a democracy committed to both pluralism and equity? How has the meaning of citizenship changed as our society has evolved? In a world made interdependent through technology, how can one best define citizenship? The book's various perspectives provide guidelines for action through examples of current programs, and the reader is invited to join new forums to discuss questions raised--forums that allow for heated, but civil, disagreement. Only by engaging in such discussions can a public consensus be reached on the best ways to educate for tomorrow. Contributors include John Covaleskie, Ellen Giarelli, James Giarelli, Jerilyn Fay Kelle, Thomas Mauhs-Pugh, Barbara McEwan, Mary B. Stanley, Donald Warren, and Zeus Yiamouyiannis. Joan N. Burstyn is Professor of Cultural Foundations of Education and of History at Syracuse University. She is the author of Victorian Education and the Ideal of Womanhood, as well as two books of poetry, Song Cycle and Waiting for the Lame Horse, and is the editor of Preparation for Life? : The Paradox of Education in the Late Twentieth Century and Desktop Publishing in the University.